Many people are familiar with dental veneers, most likely associating them with the pearly-white smiles of Hollywood stars. While dental veneers can certainly enhance the beauty of your smile, they can actually solve a variety of different dental issues. See how with your dentist in Bayside NY, Dr. Davantzis, by reading more below! A veneer is a thin layer of porcelain that is bonded to the front surface of a tooth. 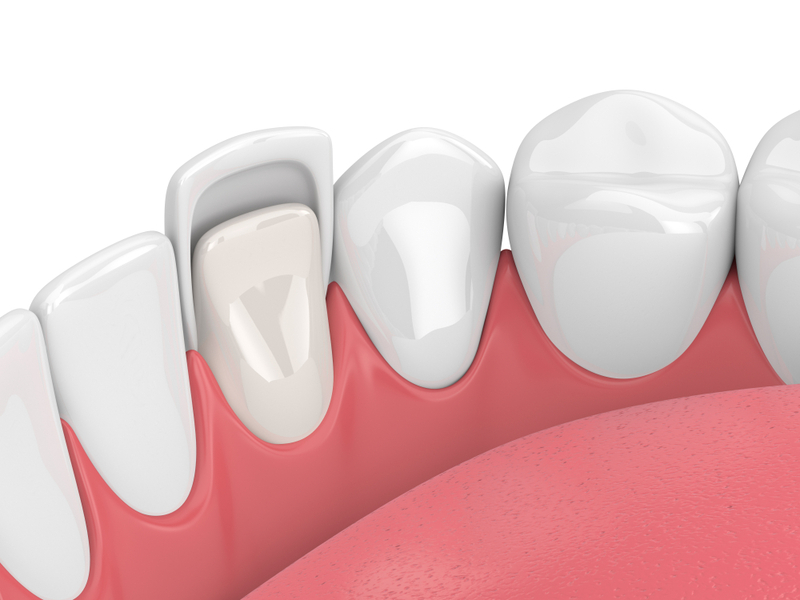 Unlike a crown, which covers the entire surface of a tooth, veneers are specifically designed to cover only the front. After all, the word “veneer” is defined as “a thin decorative covering.” Dental veneers are also different from crowns in that they are only applied to front teeth, or the teeth that can be seen when smiling. Most veneers are extremely thin, approximately 1-1.5 mm in thickness. Even at this thickness, however, veneers are still extremely strong and are designed to stand up to the everyday demands that teeth face. A veneer cannot simply be glued to a tooth, otherwise it will be too bulky and misshapen. Instead, Dr. Davantzis shaves the tooth down 1 to 1.5 mm or whatever the desired veneer thickness may be. This process makes room for the veneer and allows it to closely match the contour of your previous tooth. Once the tooth or teeth are reduced in this manner, impressions are made and temporary veneers are placed. Over the course of a few weeks, the veneers are manufactured in an outside laboratory. When the permanent veneers are ready they are cemented to your tooth. What are some reasons for getting veneers? Due to the strength of veneer material and the precision with which they are designed, most veneers can be expected to last quite a long time. There are a wealth of customization options, all of which Dr. Davantzis can advise you on for creating your perfect ideal smile. You can specify the color, shape, length, and size of each veneer to meet your exact desires, provided they all conform to the basic functional purposes of your teeth, of course. Remember, you don’t have to want a Hollywood smile to benefit from dental veneers. No matter what your concern may be about your teeth, your dentist in Bayside NY can discuss the many ways in which veneers can improve both the health and appearance of your smile. Please give our office a call today at (718)-279-9700.